You’re on the road or out of town. You want to eat something that will give you energy, nourish you and taste good…and avoid the fast food drive thru line. Inspired by all of the delicious meals I had this past week, I wanted to share something that I think will help anyone who ever eats away from home. Whether I’m out of town for business or vacation, I can find healthy eateries and restaurants, farmers’ markets, and even natural food markets and healthy grocery stores. 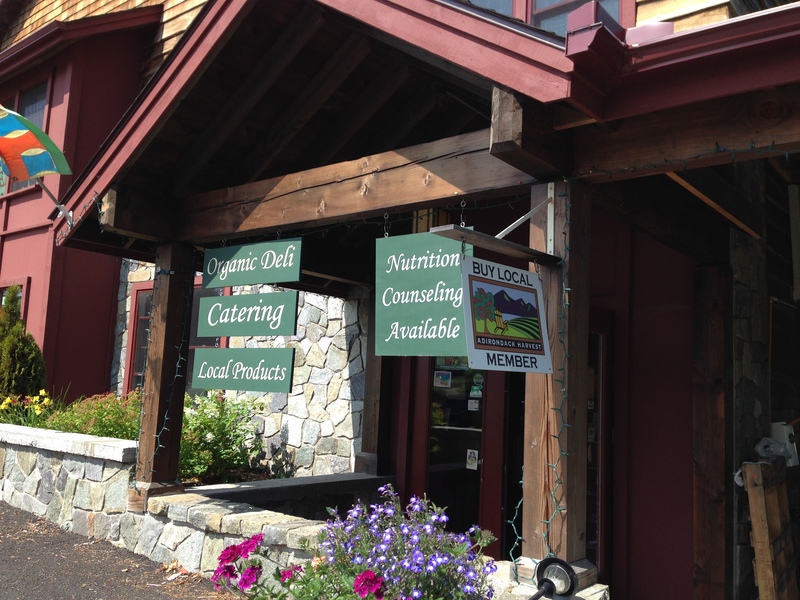 Green Goddess Foods in Lake Placid, NY – We went there for morning smoothies and some natural food ingredients at their market, but they also had fresh pressed juices, soups and sandwiches. Healthy & delicious! From Baltimore and DC to Asheville, Charleston, Seattle, Portland, San Diego and Lake Placid, I’ve used the tips I’m about to share with you to find healthy (& delicious!) places to eat. For the most part, these places prioritize local, fresh, real, nourishing ingredients without harmful chemicals like pesticides and hormones. Check out the apps and websites below to find a healthy, tasty meal…no matter where you are! What Is It? Mobile app and website that allow you to search by location, cuisine, and keyword for dining options near you. This is the #1 app I use when I travel. How Does It Work? I learned the importance of using the right search terms when writing papers in college to find the “perfect” articles for my papers, and I use the same strategy now when looking for healthy places to eat. Yelp is an app that gives you ratings for local eateries and is searchable by type. Try using any of the following search terms along with your city of choice: “juice and smoothie bar”, “organic,” “gluten-free”, “farm to table,” “sustainable,” “vegan,” “vegetarian,” or “healthy,” and see what you find. What Is It? Online plant-based restaurant guide available via mobile app orwebsite, providing healthy restaurant dining and health food store locations. It also provides user reviews, which are super helpful! How Does It Work? Search by country or region for vegetarian-friendly, vegan, or vegetarian-only restaurants and markets. Even if you’re not a vegetarian or vegan, you can use this tool to help you locate restaurants and cafes that serve healthier dishes, including ones that make plant-based dishes taste AMAZING. What Is It? Mobile app to help you find healthy restaurants near you and customize your search based on your eating preferences. How Does It Work? Enter your address or zip code and then set your preferences to find healthy places to eat near you that meet your personal needs. I love that it lets you set filters based on dietary preferences like Vegetarian, Vegan, Dairy-Free and Gluten Sensitive! What Is It? Free online directory for anyone in search of fresh, locally grown and sustainably produced food in the U.S. and Canada. Thousands of listings include family farms, restaurants, farmers’ markets, grocery stores, Community Supported Agriculture (CSA) programs, personal chefs, B&Bs, U-pick orchards and more. How Does It Work? Users can search by location, keyword, category or product to find good food, download customized guides, or plan a trip with the innovative mapping tool. And, if all else fails…Google It! Use the same search terms used on Yelp. Sometimes I’ll also search for phrases like “foodie favorites,” “best healthy restaurants” or “local and sustainable dining” along with my location, and that has helped me find some gems! Hi Rachel! I downloaded the Food Tripping app on your suggestion and it’s so cool! I’m still finding my way around my city since moving here, and this is so helpful. Thanks for the tip! Thanks for sharing, Amanda! I just learned about it the other day and thought it was super cool 🙂 glad you were able to download it, too! When we were visiting in Arizona, our saving grace was they had an incredible Farmer’s Market! We packed a cooler with ice and were able to purchase three days worth of meals. It saved our health AND our budget!